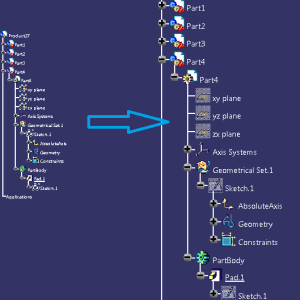 I’m sure that almost all of us are not using the right commands to simply the work in CATIA. For me it’s important to find commands that save time, because I work with large assemblies and I must hide and show parts, create lines, point, curves, planes etc. and it’s important to find a way to apply a command and this command to do more than one simple hide of one point for example. 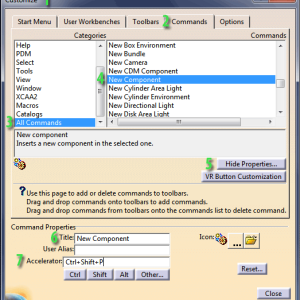 It’s important to take a look on my old articles written like Use efficent select tool in CATIA and CATIA Keyboard shortcuts where you can find useful information that can help you to use the right command to save time. Today, I have in my mind two very used commands; Show and Hide, both of these commands are available on Tools -> Show/ Hide. With this commands you can Show/ Hide elements by type (All Points, Lines, Curves, Sketches, Surfaces, Planes, Volumes, Geometrical Sets, Bodies or Axis Systems with only two clicks. With these commands you can simply hide elements by type. If you want to show elements that were hidden you must press the Sway Visible space button. Do you know other useful commands? Please tell us using leaving one comment. 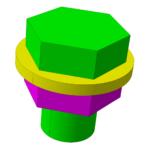 did you find some efficient way to show or hide only one part in Assembly ? Click on the part and type into Power Input: c:inversion. This inverts the selection. From there you can hide it. You must be in assembly for this to work. 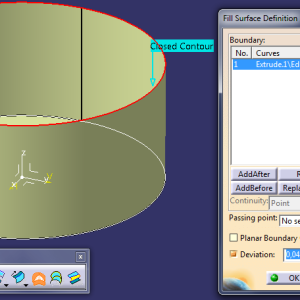 Hi Joe, my catia does not have this option under tool. Could you please show me how to turn it on?